pawar Travels provide Mumbai Airport to Pune Cab ServiceBook Cab from Mumbai Airport to Pune at affordable prices.Pawar Travels has 7 Years of Experience in providing cabs from Mumbai to Pune and Pune to Mumbai Pawar travels assure you that we provide Best Cab Services From Mumbai Airport to Pune. 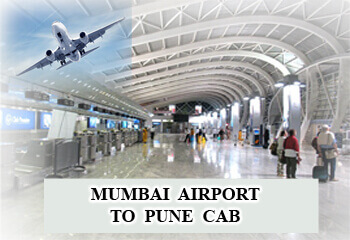 Book a cab of your intrest to travel from Mumbai Airport to Pune. With Pawar Travels Experience a Comfortable Journey by booking Mumbai Airport to Pune Drop Cab.You cab now easily make a payment by Net- Banking or Paytm our Paytm number is 9822550396 the easiest Payment making Method. Chatrapati Shivaji International Airport is also known as Sahara International Airport which is the second busiest airport in the country according to the international passenger. The Airport has two terminals Terminal 1 which is dedicated for domestic passanger and if you need a cab from Mumbai Airport Terminal 1 to Pune Cab or Mumbai Domestic Airport to Pune Cab just Call Pawar Travels on 9822550396 and Book your cab. The new Terminal 2 is catering both International and Domestic Passenger.so you can book Mumbai Airport Terminal 2 to Pune Cab or Mumbai International Airport to Pune Cab. Pawar Travels provide Cheapest Cab from Mumbai Airport to Pune and daily running cabs from Mumbai to Pune are 25. Cab Charges from Mumbai Airprot to Pune,Mumbai Airport to Pune Cab Rates are Indica 2000/- Indigo 2200/- Dzire-Etios-Logan 2400/- Tavera 3000/- Innova 3300/- all are Including toll and One-Way A/C Cab charges. With multiple places to go to in and around Pune, it's going to be slow to stay dynamical your suggests that of transport. we tend to advocate a full package from Pawart ravels that permits you to explore the place at leisure and during a price effective manner. At Pawar travels, we've got created you-drive from Mumbai To Pune terribly straightforward and convenient. you'll be able to opt for Indica, Indigo, Innova, or any cab of your alternative. Have a secure and unforgettable trip with Pawar travels. The distance from Mumbai To Pune is 149 kilometre and it takes 4 hrs to reach by cab . Your Cab can cross through lush inexperienced mountains of Western Ghats, that bring trip a pleasing and unforgettable one. 1) Affordability: we've got taken care to supply the foremost reasonable rates for your Mumbai Pune Cab. you'll be able to read details of Mumbai-Pune itinerary from the booking tab higher than. the small print of Mumbai To Pune Taxi fare with no hidden charges are provided direct. 2) Courteous Drivers: we tend to promise to allow you the simplest cab service in Mumbai . Convenience of Mumbai Pune Cabs . With operational Taxi service in Mumbai, Pawar travels's service is obtainable across all major Indian cities. Pawar travels helps you travel any place within Pune, Maharashtra . 3) wide selection of Cars: you'll be able to opt for a cab or a Taxi in Mumbai from a large range of Taxi cars like Indica, Innova and Sedans. 4) we offer the simplest cabs in Mumbai at the simplest value. 5) With a trained driver, we provide you the simplest Mumbai Pune Taxi Service. For additional details on your Mumbai To Pune Cab, you'll be able to decision 9822550396. We have taken care to supply the foremost reasonable rates of fare from Mumbai To Pune. With reasonable costs, courteous driver and timely convenience of automotive, we provide you the simplest Mumbai Pune Taxi Service. The time from Mumbai Airport To Pune is around one hundred fifty five kilometre. you'll be able to book a Mumbai Airport to Pune Taxi at Pawar travels automotive Rentals well earlier. Mumbai is understood because the business hub of Asian nation. there is many things Mumbai should offer- busy streets, giant monuments, beaches, street food etc. you'll be able to get many streets. you'll be able to additionally realize 24x7 restaurant and pubs, luxurious restraurants . Pune is found at around 153 kilometre from Dadar. Book Dadar To Pune Taxi here at Pawar travels at the simplest fares offered within the market. The distance from Bandra To Pune is 121 kilometre and our drivers cowl this distance within the most best means. Pawar travels is unquestionably the simplest place for you to book Bandra To Pune Taxi. we offer all the simplest facilities to create your journey safer and pleasurable. Check out cab services from Borivali to Pune cab. you're at the proper place to book Borivali To Pune Taxi. Pune is huundred twenty fourb kilometre far from Borivali and can take regarding three hrs to hide the gap. you'll be able to opt for among the automotive choices that Pawartravels provides like Innova, Indica etc. decision North American country to induce the small print regarding Borivali to Pune fare. Kalyan is found at regarding 147 kilometre far from Pune and would need roughly three hrs to hide the gap. With the services offered by Pawartravels, you'll be able to have a snug journey from Kalyan To Pune. Book Kalyan To Pune cab at the simplest rates offered. decision North American country To induce additional details regarding Kalyan To Pune Taxi fare. Thane is one in all the highest locations in Mumbai and at a distance of regarding one hundred fifty kilometre from Pune. Contact North American country to induce additional details regarding Thane To Pune Taxi Service and additionally regarding Thane To Pune Taxi fare. Distance between Mumbai and Pune is 148 Kms and therefore the average period is three Hrs employing a cab.